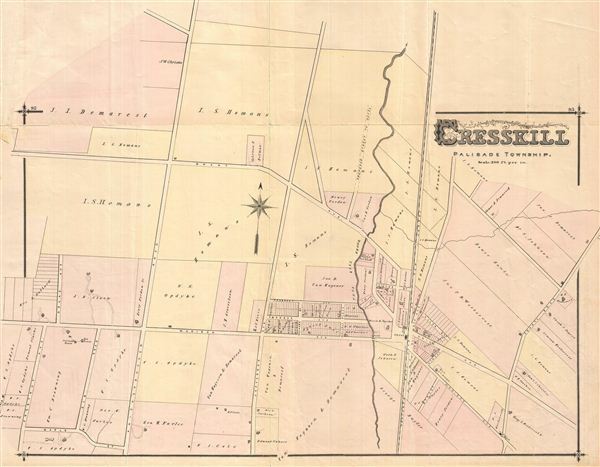 Extremely detailed map of Cresskill in Palisade Township, New Jersey. Published in Walker & Pease' exquisite centennial 'topographical, illustrated, historical, descriptive' Atlas of Bergen County, New Jersey, 1876. Walker, A. H., and Pease, C. C. Atlas of Bergen County, New Jersey, 1876. Good. Even overall toning. Original centerfold exhibits verso repair. Minor discolorations here and there. Edge wear mostly confined to margins.